Going forward, I've got some fun things in the works in the near future. Next month is my birthday month so I'm definitely dreaming up ways to celebrate (stay tuned for giveaways!). April is my annual intensive look at all things baking, and I've already partnered with some fabulous brands to make this year's line up the best yet. Plus, upcoming adventures to North Carolina, Washington DC and Cincinnati will allow me to change up my routine a bit and showcase more cities outside of the Baltimore area. Because I'm doing a complete overhaul of the blog, there may be glitches going forward with broken links and formatting of pages. Please let me know if you experience these because it'll help me make the transition as smooth as possible. Besides just the website update, my social media channels are changing as well, so make sure you link up with my new accounts going forward (see icons to your right at the top of the page). Finally, I want to give a heartfelt thank you to you, my readers. When I started this blog, I had no idea how long it would go and what it would become. Thanks to your support, Eating Out Without has grown into its own and has helped me grow personally and professionally. I am a far better advocate and cook than I was when I started out, and am much happier and healthier thanks to the products and restaurants I have discovered as a result of the blog. One last note- because of all of the changes on the blog, I am a bit late to the Valentine's Day game. Instead of focusing one one day, I want to celebrate February as the "month of love" with a little giveaway from Enjoy Life Foods. I'm drawing a winner at the end of the month who will win a love-filled box of goodies from Enjoy Life Foods. 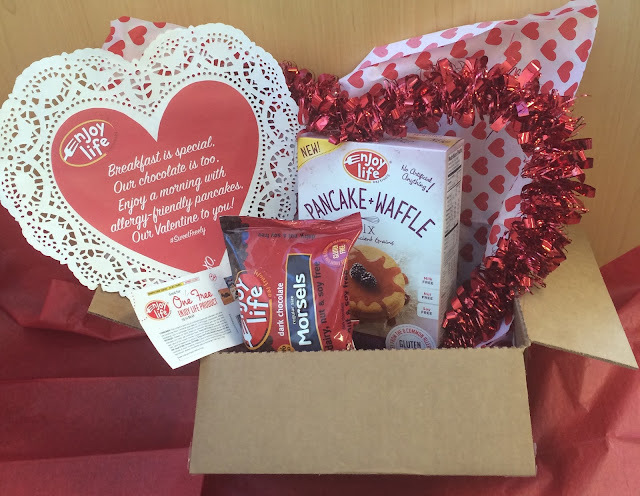 You will win a heart-shaped pancake stencil, one box of pancake mix, one bag of dark chocolate morsels, and one coupon for a free Enjoy Life Foods product of your choice. Imagine how delicious chocolate chip pancakes would be with your loved one! Read my full review of the featured pancake mix right here. I would you share heart-shaped pancakes with my dear parents, for a family brunch. As a college student far from home that's who I want to share my pancakes with the most! With my daughter and husband! I would love to share with my husband and four kiddo's! We love to do Sunday morning pancakes, so this would be perfect! It's a great way for us to bring everyone together on the weekend! I would share them with my boys. I suppose I'd make them for my family :). They'd be surprised. I would share them with my husband & daughters. I'd share them with my husband...he loves pancakes! I would share them with my little boy! I would share the heart shaped pancakes with my hubby! I'd share them with my husband, who is a HUGE pancake lover! I would share them with my kids. They look awesome. I would definitely share heart shaped pancakes with my niece. We love making shaped pancakes and although we typically make dinosaurs, we would definitely love hearts too. I would love to share these with my husband and son. I would share with my best friends.